Ok, so I tossed the stash a bit earlier this week. I really didn't dig that far into it cause I kinda knew what I was looking for - the Wollmeise and the Madelinetosh Tosh Merino Lite. 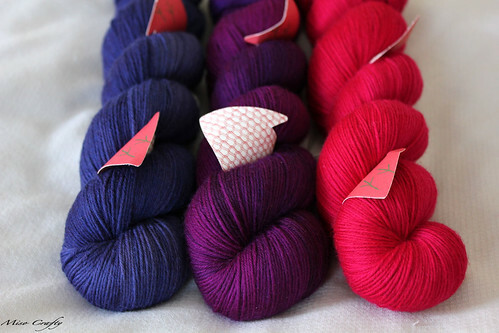 Just so that this post doesn't become pages long, I'll just talk about the first batch of Wollmeise colour combos that I'm thinking for the Westknits Mystery Shawl KAL. Some background info before I start throwing colours at you: Mr. West has requested that 3 colours be choosen for this shawl. One of the colours will be the "anchor" colour. 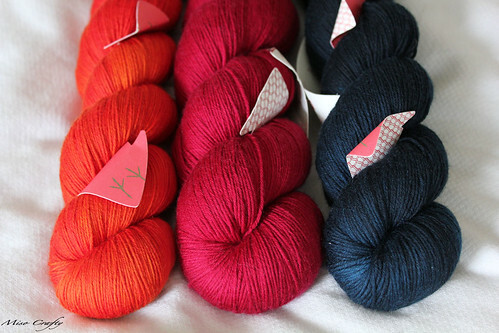 As in it is the colour that will "frame" the shawl, and will be the colour used the most. The other 2 colours could be 2 shades of one colour, or they could be the colours that pop out from the anchor. I studied some of the previous Westknits patterns like Daybreak, Creekbed, and Spectra (sorry, this one is a Ravelry link! 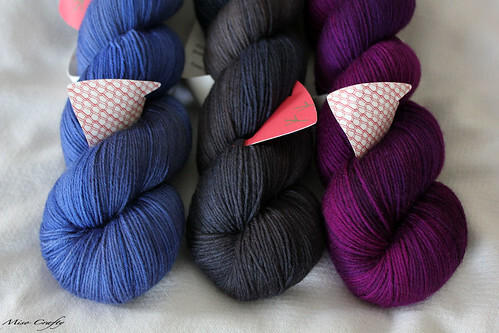 ), to try to get a feel as to how colour could possibly play in this mystery shawl. When I first started thinking up colour combos the first one that came to me was black, grey, and hot pink...naturally!! That has to be one of my utmost favourite combos ever! 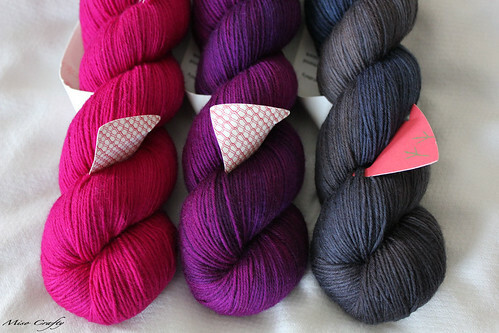 A super duper close second would be light pink, dark pink, and chocolate brown. 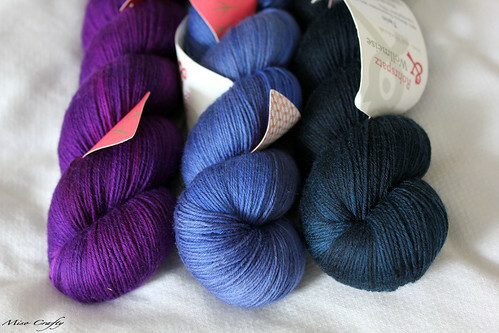 Unfortunately I don't have much for greys, don't have black or even a true chocolate brown in my Wollmeise stash. 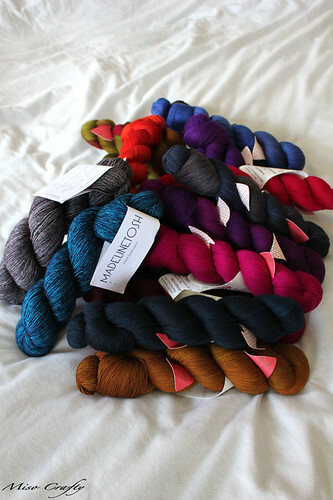 Although, that could be remedied next week...yes, I was weak in the face of a Wollmeise update and could have possibly purchased a grab bag or two...or three. But hey, who's counting?? *Ahem* Carrying on...I pretty much played around with the semi-solids/tonal skeins that I currently have and was quite surprised as to how many combos I came up with. Some of them are drastically different from the others and from my usual colour palette, and some are a little off from the next combo by a skein that is slightly lighter or darker from another shade. So that's where you, my dear Blog Friend, come in. Help me narrow down the search!! Eeeek! #1 - Fuschia, Fliederbusch, Graf Ratz. The Graf Ratz would be my anchor colour, and yes, that is a streak of blue in there amongst the grey. The Fliederbusch is a bright pinky purple. 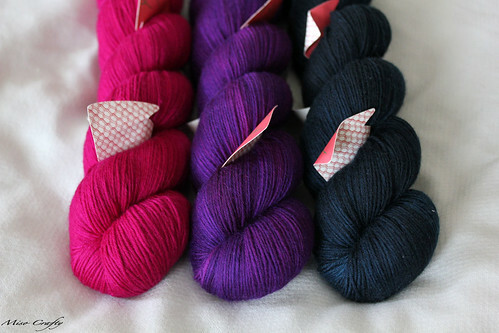 The fuschia was super hard for me to capture properly, especially when placed with the other 2 skeins. #2 - Fuschia, Lavendel, Admiral. The Admiral would be my anchor. Yes, not a huge difference than the combo above, but the Admiral makes the other 2 colours really pop, and using a darker purple makes the fuschia even hotter. You can't really tell in this photo, but the Admiral is a really dark navy blue, and this shade of purple is a bit deeper and slightly darker than the one shown in the photo above. #3 - Chim Chim Chimney, Graf Ratz, Fliederbusch. I would be using the Graf Ratz as my anchor. #4 - Lavendel, Chim Chim Chimney, Admiral. Not too much of a difference than the last combo, the Admiral would be my anchor and the darker purple makes the blue look lighter. #5 - Taube, Fliederbusch, Himbeere. Jewel tones that make me smile! 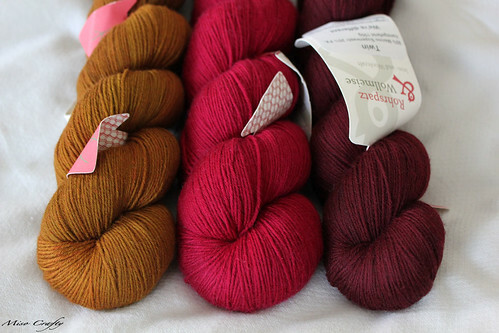 I have no idea which colour I would make my anchor, and the photo doesn't do it justice but the Himbeere is more of a reddish pink in real life. #6 - Tollkirsche, Campari Piccolo, Golden Pear. This combo is soooo out of my usual colour comfort zone, but would be fabulous for fall, don't you think? 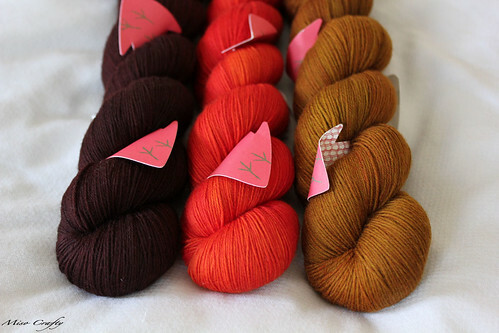 The Tollkirsche, which is a dark reddish brown, would be my anchor. Not sure if your monitor will let you see it, but the Golden Pear actually has flecks and some streaks of a subtle orange in it. #7 - Campari Piccolo, Dunkle Kirsche, Tollkirsche. Substituting the Golden Pear with the deep red Dunkle Kirsche. This combo reminds me of an autumn sunset. #8 - Campari Piccolo, Dunkle Kirsche, Admiral. Not really a favourite now that I'm looking at it for the millionth time but thought I would throw it out there. I don't think I have to, but I'll say it anyways...the Admiral would be the anchor colour. #9 - Golden Pear, Dunkle Kirsche, Merlot. At first I thought I would use the Merlot as the anchor, but looking at the photo again, I think the GP would be an even better choice. The DK and the Merlot are within the same colour family that it would be better to accent them with the GP than mess with the colour wheel. #10 - Versuchskaninchen, Pistazie, Golden Pear. Actually, now that I'm looking at this photo again, I'm not sure why this is even an option. But it is nice eye candy, no? So what do you guys think? Stick with my usuals and go with something pink? Or live on the wild side and do something completely and totally different from what I'm used to?? I've also considered breaking into my most cherished stash of Limone (a bright yellow) and mixing it with the orange and either the Tollkirsche or Golden Pear. Arg! The possibilities are endless!! How am I going to decide on just one combo?? 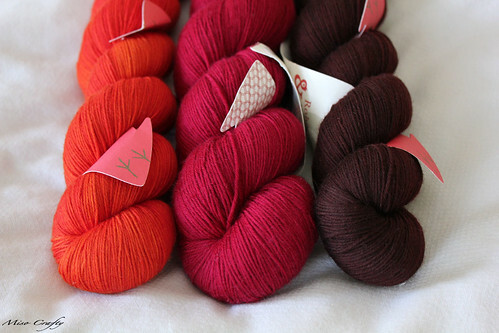 Who else is doing the Westknits KAL? Have you decided on a trio of colours yet? Do share! ahhh!!!! too many choices!!! I think it's easier for me to say that I don't like #4, and although #6 appeals to me in theory, there's something about it that I'm not diggin. On feeling alone, I like #2, 5, 7, and 8, but part of me is wondering if the contrast between the orange and pink in #7 & 8 will be distinct enough/play right. I love #1 and #7! Thanks so much for your opinions guys! 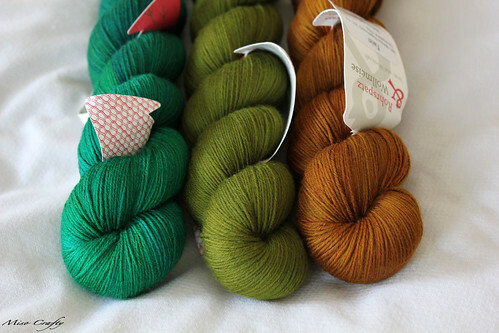 I think I need to stop looking in my stash cause even more colour combos are popping up! Needless to say, both #1 and 2 are at the top of the list! Wow, I am so envious of your stash! You have a great eye for colour! ...I also noticed you finished your Georgia! I can't wait to see pictures of the finished product! Hooray!